The Amish Plymouth Hutch features a spacious cupboard area, smooth pull-out drawers, counter space, and glass display doors. Standard additions include complete hardwood construction, touch lighting, dovetailed drawers, solid tongue and groove backing, and glass shelves. These premium features come standard with this beautiful hutch. The Plymouth Hutch also comes standard with full-extension, soft-close, concealed drawer slides! This provides you with easy access to the whole drawer, more accessible storage space, and convenient drawer closing. 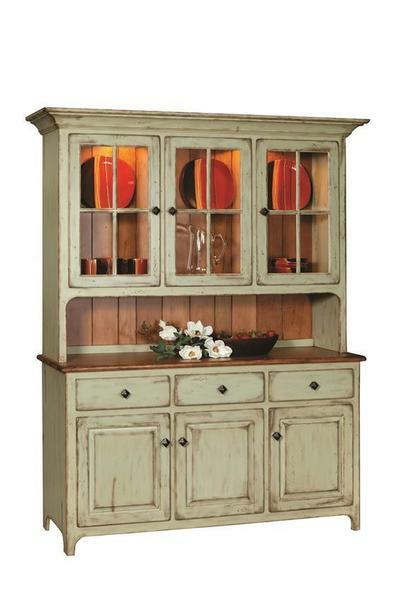 The beautiful hardwood back-paneling provides the china hutch with a warm rustic charm, while the Early American style influences keep the piece humble and inviting. This stunning Plymouth hutch can be built in a 2-door, 3-door, or 4-door style to fit your personal space requirements and is available in a wide array of stunning solid hardwoods, finishes, and hardware options to match your home decor and dining storage needs! Call us today to speak to a knowledgeable and friendly Amish furniture specialist at 866-272-6773 or visit our store in Florida.